Ready to FOCUS on your projects or business for an afternoon? 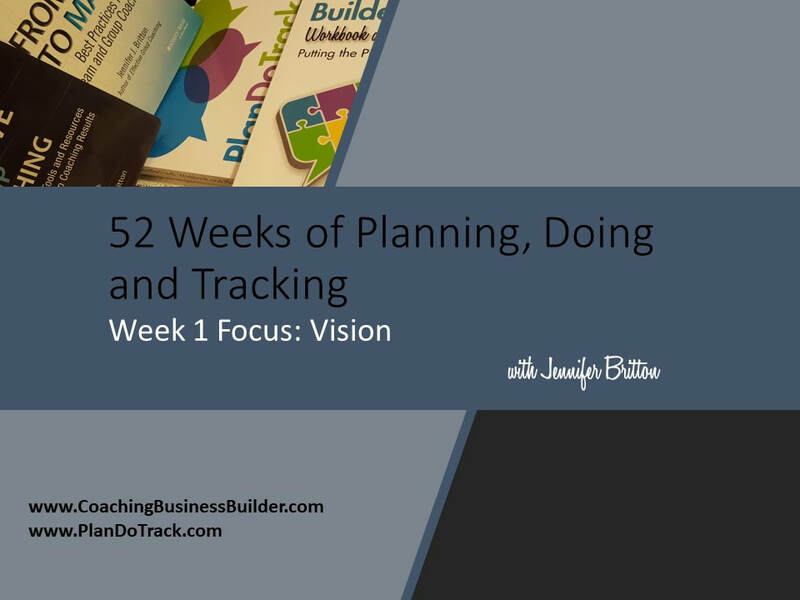 Are you enjoying the PlanDoTrack Workbook and Planner OR the Coaching Business Builder Workbook and Planner from Jennifer Britton? To help you get the most of out of the planner, she's created a 4 hour virtual retreat called PLAN.DO.TRACK. If you are looking for a virtual forum to do some of your business planning in a focused way, while GETTING INTO ACTION, these are for you. What? 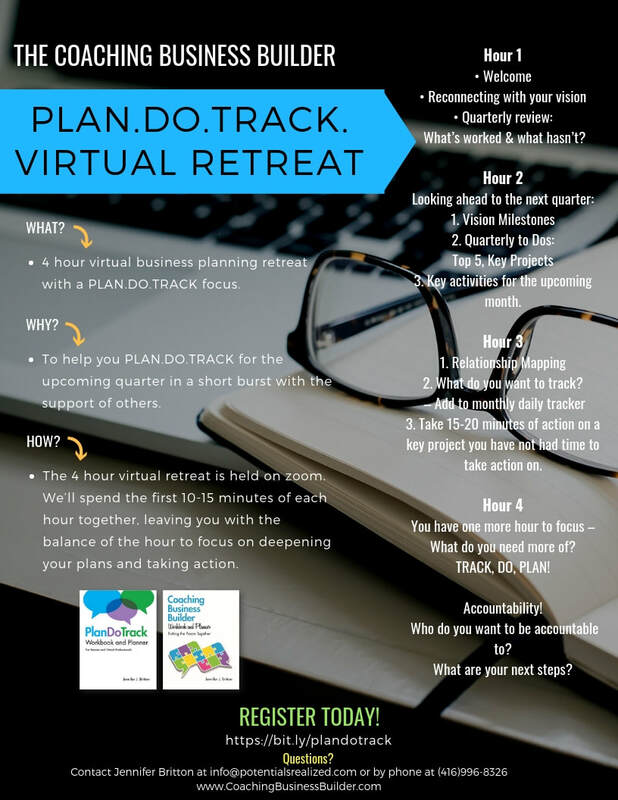 4 hour virtual business planning retreat with a focus on PLAN.DO.TRACK. Sessions are held on zoom, and consiste of hands-on planning and working sessions for you and your business. Each hour has a different focus around PLAN.DO.TRACK. Hours 1 and 2 fill focus on PLAN. As we know, 10 minutes of planning saves 2 hours of unfocused effort. By spending a significant amount of time here, it will help you get into leveraged actions for your business. Hour 3 Focuses on DO. Hour 4 focuses on TRACK. Based on your experience throughout the day you’ll leave with your top 3 action steps, and clarity HOW and WHO your will be accountable to (TRACK). 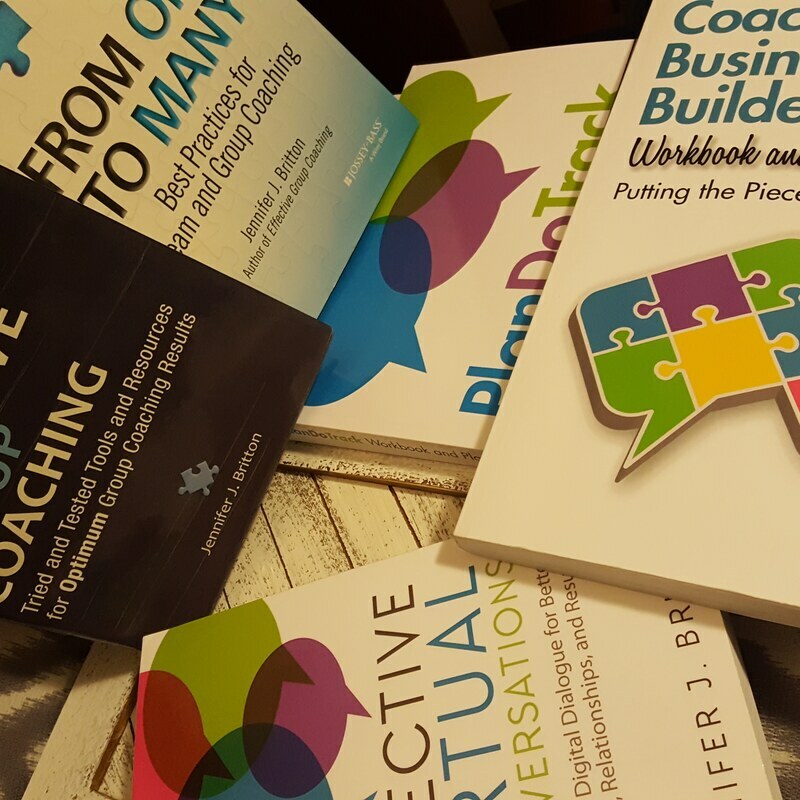 Your copy of the Coaching Business Builder (For Coaches) or PlanDoTrack (for Virtual Professionals). Pick up a copy at Amazon. Coaches: Don’t have a copy of the Coaching Business Builder yet? Jennifer will provide you with the necessary digital material to complete the retreat, before your copy arrives. Order a copy at Amazon. "Taking these four hours for myself was such a gift. Everyone knew I was committed to this and gave me the space to work hard on putting my calendar back together after what looked like an explosion in my life. I feel so much more at peace and able to keep all those plates spinning easier. "- Jen C.
Contact Jennifer directly to reserve your spot and be invoice directly at (416)996-8326 or use the link below to reserve your spot. 2019 pricing is $129 US per person. Inquire about group rates for your group of 4 - 10.